"Comedy Tonight for the Grand's 100th"
The Grand Theatre has chosen to celebrate its 100th birthday with Stephen Sondheim's musical celebration of ancient Roman comedy, "A Funny Thing Happened on the Way to the Forum". On September 9, 1901 the Grand Opera House, as it was then called, welcomed its first patrons to a performance of the melodrama "Way Down East". In the 1920s it became a movie theatre, but in 1945 three local amateur theatre groups banded together as the London Little Theatre and reclaimed it for live performances. In 1971 the theatre began a three-year process to become a fully professional regional theatre and is now the largest regional theatre in Ontario. "Funny Thing" is a very appropriate choice. 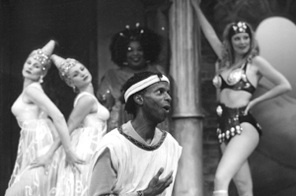 When Burt Shevelove and Larry Gelbart wrote the book for the musical, little did they realize that the show would become most people's sole experience of anything resembling the ancient comedy of Plautus (c. 254-184 BC) with its set of three houses, bawdy humour, farcical plots and collection of comic types. Sondheim responded with youthful exuberance quite unlike the darker mode of his most recent creations. Sondheim enthusiasts will be pleased to find that this production is more complete than most, including the song "That'll Show Him" cut from the 1972 Broadway revival and "Pretty Little Picture" cut from both it and the 1996 revival. The production itself is quite enjoyable but, were it not for some unhappy directorial decisions, it could have been more effective. My primary complaint is that the musical is amplified both for speaking and singing. We are told nowadays that audiences expect musicals to be amplified. That is a self-fulfilling prophesy and it was certainly not true in 1962 when the show premièred. If Stratford could do their highly successful Gilbert and Sullivan series in the 1980s unamplified in the 1100-seat Avon Theatre, why should the Grand need to amplify Sondheim in its smaller 839-seat theatre, especially with only a six-piece band? What is lost through amplification is the unmediated effect of the performers' power on the audience. My second complaint is director Bob Ainslie's haphazard pacing. Farces such as this need taut direction since only a crisp pace can make tension mount. Here surprise entries are too slow and there are lulls in the dialogue and lags between dialogue and song. For a farce to run like clockwork it needs to be wound up tight. Allan Willbee's set captures the right mood with its tilting columns and slightly tipsy houses rather like a Loony Tunes version of a Roman street. Bonnie Deakin's earth-toned costumes for the principal characters suits Wilbee's sets, but she lets herself go a bit too far in her costumes for the courtesans and their keeper. Yes, the courtesans are supposed to be highly differentiated but here they each seem to have descended from various 1950s sci-fi movies rather than ancient Rome. Ainslie has not asked for especially interesting lighting from Steven Hawkins, except for bizarre signals of mood shifts within songs. At the centre of the show is Denis Simpson as Pseudolus, the slave who wants to win his freedom by helping his master Hero win the girl he loves. Simpson is immensely talented, with a malleable face and a voice able to mimic anything he thinks of. Though often very funny, he seemed to me to being trying too hard. Under his various grimaces and sound effects there seemed to be no underlying character. In the best productions we are always aware that Pseudolus's increasingly outrageous stunts are aimed at a personal goal--his freedom. Here after the song "Free" that goal dissipates into manic energy. By contrast, Ed Sahely (Hysterium), Jayne Lewis (Domina) and especially Neil Foster (Senex) receive just as much laughter by staying within a well-defined character, whether the fusspot household servant, the domineering wife or her grumblingly submissive husband. Foster's hilarious portrayal of a man as aware of his desire as his inability to perform stole the show. In other roles, Gregory Cross (Miles Gloriosus) is suitably imposing in bulk and voice, A. Frank Ruffo (Marcus Lycus, the dealer in flesh) suitably sleazy and Bryan Foster (Erronius) suitably addled. The discovery of the evening was Jamie McKnight as the dim-witted Hero. Not only is he a good actor but he has a very attractive singing voice that made "Love, I Hear" and "Lovely" the musical highlights of the show. Callandra Dendias, as Hero's beloved and equally dim-witted Philia, also has a strong, clear voice, but hadn't a clue how to play a dumb blonde. Rick Kish, Michael-Lamont Lytle, James Quigley are excellent as the "Proteans" who play multiple roles, particularly funny as the Marcus Lycus's mincing eunuchs and Miles Gloriosus' spear-twirling soldiers. Caitlin Murphy, Jenni Burke, Catriona Ferguson, Heidi Ford, Tanya Rich and Janet Zenik play the Courtesans, all adept at performing Kimberley Timlock's varied choreography. "A Funny Thing" is a reminder of a time when people expected musicals to have witty lyrics, good tunes and a bit of ribald humour. It the perfect piece to revive for a celebration since it is itself a celebration of theatre. Even if the show is not a tight as it should be, it makes a positive impression and is a happy start to the Grand's second 100 years. Photo: Denis Simpson (foreground) with courtesans. ©2001 Grand Theatre.